After meeting at Quentin Road’s former Wilderness Camp by Leech Lake in Minnesota, Dan Reehoff and Aimee Kahara began a journey that would lead them to accomplish great things together for Christ. They are now happily married, with the addition of two sons, Bryce (age 10) and Cole (age 8). While attending Dayspring, Dan faithfully worked in the print shop, and Aimee was a preschool teacher. After graduating, Dan became the director of Reformers Unanimous and a part of Quentin Road’s travel department, and Aimee became an office worker and an integral part of the music and radio ministries of Victory In Grace. After the couple graduated and in the ensuing years, the Lord began preparing them for their own ministry. They began DaySpring Baptist Church on May 31st, 2009. After gathering in a hotel meeting room for over two years, they now lease a beautiful building three evenings a week to accommodate their growing ministry. In addition, they recently expanded their services to include Sunday School and an addictions program. 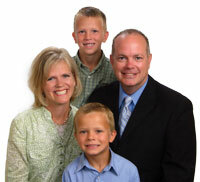 Please keep the Reehoff family in your prayers as they continue to shine as beacons of light for Christ.